Can India’s Agriculture Sector be Saved? Venture capitalist Mark Kahn shares some thoughts on how to fix India’s struggling agricultural sector. Onions are front-page news these days across newspapers in Delhi. Onion prices, along with those of several other vegetables, have been steadily rising. There is almost a sense of déjà vu, as each year one or two vegetables become a cause célèbre for the middle class. What it also does is indicate the vast inefficiencies across the agricultural supply chain in India. That India’s farm economy must be made more efficient and productive – urgently – hardly bears repeating. Despite a glut of seemingly pro-agriculture subsidies, policies and sops given to the agricultural community by successive governments, the outlook on India’s farm economy remains anything but healthy. Thousands of tons of grains are wasted because of lack of storage and transport facilities, even as farming remains a gritty battle of a profession. 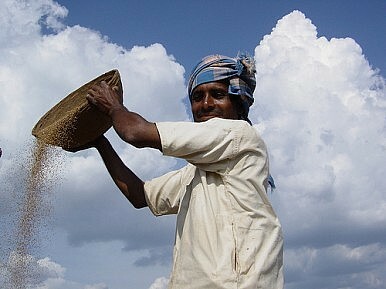 Clearly, the multitude of policies and short-term thinking has only made Indian agriculture unsustainable, although there was some good news in 2012: India overtook Thailand as the world’s largest rice exporter, and emerged as the world’s top exporter of buffalo meat (known as carabeef in the global market). It doesn’t seem likely that we will stumble on a silver lining in the agriculture sector, or much else in the Indian economy right now. But, as with most things in India, while things remain the same (or get worse), there are also smart and worthy efforts at improvement. In the case of agriculture, a handful of venture capital and private equity players are focused on making Indian agriculture both more productive and more profitable. Mumbai-based Omnivore Partners is one such venture capital fund. Founded in 2010, Omnivore has already invested in six start-ups in what they call “ag-tech” (agriculture technology). Mark Kahn, a founding partner at the firm, believes agriculture in India urgently requires the application of technology. It’s difficult not to romanticize Kahn’s journey so far. A Harvard Business School grad, his passion for – and knowledge of – Indian agriculture are impressive. As is his spoken Hindi, picked up over the past several years spent living in India. I recently had the chance to chat with Kahn in Delhi, where he laid out his wish list for Indian agriculture, and the big fix-it’s the sector needs to mature. “First, there must be a revamp of agricultural education. It is an incredible crime against rural India that agriculture is not taught as a subject in rural schools. It reflects a one-size-fits-all approach to education which denies the basic fact that half of this country is attached to cultivation as a full-time/part-time job, and it denies the rural masses an opportunity to avail themselves of the benefits of agricultural sciences which will increase agricultural yields, and improve the sustainability of Indian agriculture. “Bihar (an eastern Indian state) has begun a fledgling initiative to introduce agriculture as a core subject in primary and secondary schools. The western state of Maharashtra (where agriculture ecosystems are among the most developed in India) has approved in certain pockets a vocational course in agriculture. There should be a national effort to design a curriculum for agricultural education from grade six through grade 10, and to recruit a separate cadre of agriculture educators who would serve multiple rural schools, imparting both classroom education and practical exposure to real agriculture. “Second, we need to have a national policy rethink on land consolidation, which is not to say that we need to encourage small farmers to sell their landholdings. Rather, we need to make it easier for people who intend to keep the ownership of their ancestral land to lease it or rent it to corporate or other organizations who will take over farming of that land. They need to be able to do so without the fear that such land will be taken away from them. The precedent for this is Argentina, where you find that many urban Argentinians continue to hold rural, agricultural land even though they haven’t tilled the land, and specialist agricultural companies have come up, such as Los Grobos which manages hundreds of thousands of hectares of land for small farm land owners across Latin America. “The problem in India today is that you have tremendous legal uncertainty when leasing land, especially to one’s neighbors, and also to corporates. That prevents farmers from focusing on urban opportunities, or merely working in town. This does not require new laws. But, it requires a different approach to the regulation of land. The state of Rajasthan has done some good work on this, and there’s a huge possibility for other states to follow too. “Most of all, agriculture in India ails from policy inconsistency. The government of India seems totally allergic to consistent policies. It’s impossible to advance agriculture in India if the government changes every policy without giving the earlier policy a chance to show its possible impact, and benefit. There are an incredible number of dramatic policy shifts – look at the way we ban exports on sugar, the way we ban exports on cotton, or how we create a futures exchange, then ban half the items listed on the futures list when global prices go up.